COUPON: Save 30% off your entire Arhaus order. Expires 4/30/19. Today’s guide is an Arhaus sofa review and intended to be an overview of the entire Arhaus sofa lineup. While we’ll be discussing the Arhaus couch line in general, we’ll also be taking an in-depth look at the Arhaus Kipton sofa. Over the last few weeks we’ve been trying the Kipton at our home and testing lab. So with that intro out of the way, let’s get started. Difficult to clean fabrics, as many require the use of a water-free cleaning solvent. How to Buy an Arhaus Sofa? Should You Buy An Arhaus Sofa? The sofa lineup that Arhaus offers is extremely exhaustive, featuring over 60 different independent styles. This Arhaus sofa review in particular is going to be looking at the broader scope of Arhaus sofas as well as more detailed in-home tests that we’ve done on one sofa in particular, the Kipton Sofa. Jumping right in, let’s first talk about materials and design. Is the Arhaus sofa comfortable? While exact feel and comfort will vary on each style of Arhaus sofa, this review is specifically testing the Arhaus Kipton sofa. In terms of comfort, it was extremely comfortable. The sofa seat cushion has a buttery softness. It provides pressure relief and a slight contouring hug, but still has enough push-back within the pocketed coil core to provide good support. 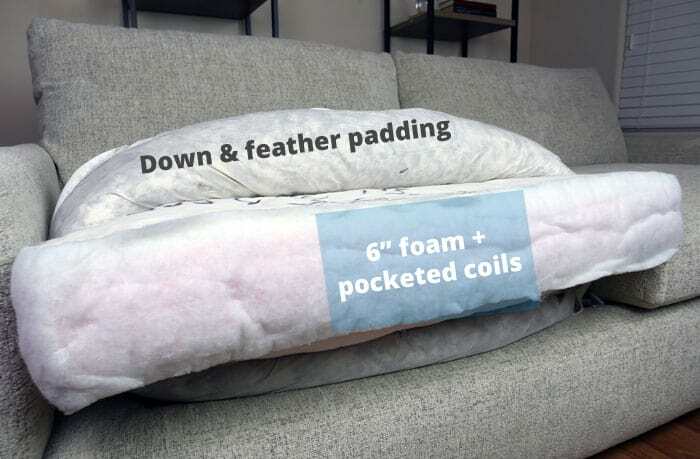 The seat cushion core is surrounded by a thick layer of feathers and down, which provides the instant pressure relief. The back cushion is 100% poly fiber and is packed quite densely, providing good support, while still relieving pressure. Do all Arhaus sofas feel the same? The exact construction and feel will certainly vary between different sofa styles. Sofas with tufted or fluted backs, like the Club sofa or Leoni sofa, may feel firmer than a sofa with plush or overstuffed backs, like the Landsbury sofa or the Baldwin sofa. In terms of firmness, I would say the Kipton is around a 4 for the seat and an 6 for the back. (See guide below). To give you an idea of how this firmness is achieved, below I’ve outlined the construction assembly of the Kipton sofa. The back cushion is 100% encased poly fill with a removable cover. The vast selection that Arhaus offers can be a little overwhelming. To simplify the process, we asked Arhaus what their most popular sofa models were. Like I mentioned above, the fabric selections for each sofa can vary, but they do seem to have a consistent quality to them. Most Arhaus sofas are available in one “in stock” color, 2-10 “custom colors” and offers over 500 “special order” colors as well. You can order physical swatch samples of any of the fabrics available. Easy Care fabrics: Easy Care fabrics are easier to clean and more stain-resistant than non “Easy Care” fabrics. Some fabrics in this collection are even machine washable, although the exact details may vary by sofa. All Arhaus sofas are available in Easy Care fabrics, but not all sofas are available in ALL of the different fabric options. Worry Free Plan: This is a 5-year accidental plan that covers rips, stains, tears, burns, and even pet damage (only covers pet damage once). This plan will also cover seam separation. 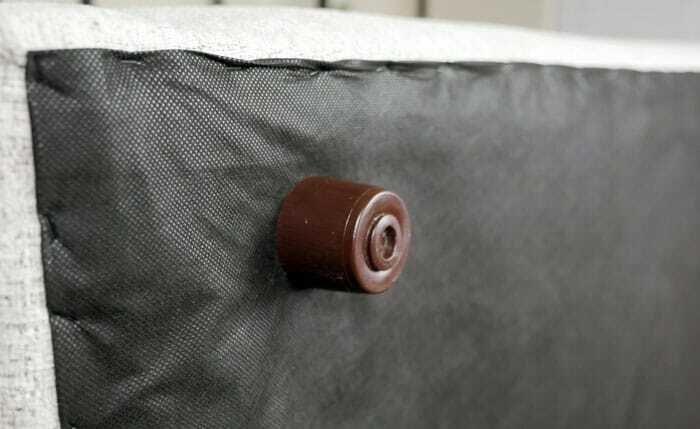 This coverage can also be applied to outdoor sofas, covering additional damage like breakage and fading from the sun. Buying an Arhaus sofa can be done one of two ways, in-store or online. As not all buyers are near to a local store, buying a couch online is a popular approach. Select the style of sofa. NOTE: Keep in mind that the exact options may vary, based on sofa style and type. Not all Arhaus couches have variable widths and / or depths. Once you’ve fully specified the sofa, it’s time to wait. For in-stock fabrics, it takes about 3 weeks for the order to be processed, shipped, and arrive at your door. If you’re ordering a custom sofa, it can take a bit longer, generally 8-12 weeks to produce the sofa and then an additional 3 weeks for processing and shipping time. For sofas and Arhaus couches, there is an additional fee for large-parcel delivery. The prices listed below includes the White Glove delivery service mentioned above. Want cheaper shipping options? Check out the the Taylor Easy Connect collection. This style ships for free to you doorstep. White glove delivery is not available. There is a 14-day “trial period” on all Arhaus sofas, excluding the sofas on clearance. That being said, the exact details of the return policy is a little tricky. We received the following details below, directly from Arhaus. All orders require a 50% deposit. If you special order a sofa in a fabric of your choice and decide to cancel, you lose the total deposit. Purchasing it as shown and decide to cancel once it has been scheduled for shipment, you lose 10%. If it is delivered and then you want us to return it, you pay a 2nd delivery charge also. The “delivery charge” is a bit of a gray area, as it varies based on how close you are to an Arhaus shipment site. Delivery feels range from $299 to $499, depending on your location. Special Orders: Special orders cannot be returned, cancelled or exchanged for any reason other than defect or damage. The frame of the Arhaus sofas is made from solid hardwood. The exact dimensions and species of wood may vary based on sofa style. Looking specifically at the cushions on the Kipton sofa, I can say that we were impressed. 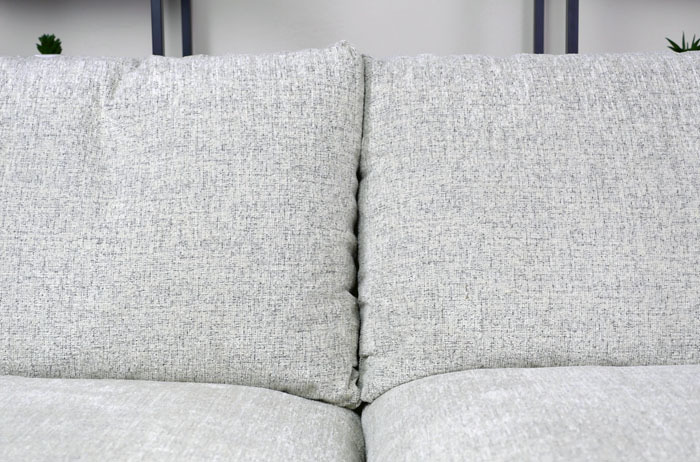 All of the cushions on the Kipton sofa are loose from the back and have a zippered closure. Regarding comfort, the Kipton sofa cushions were great. I found the back to be around a medium-firmness and the sofa seat cushions to be quite soft. 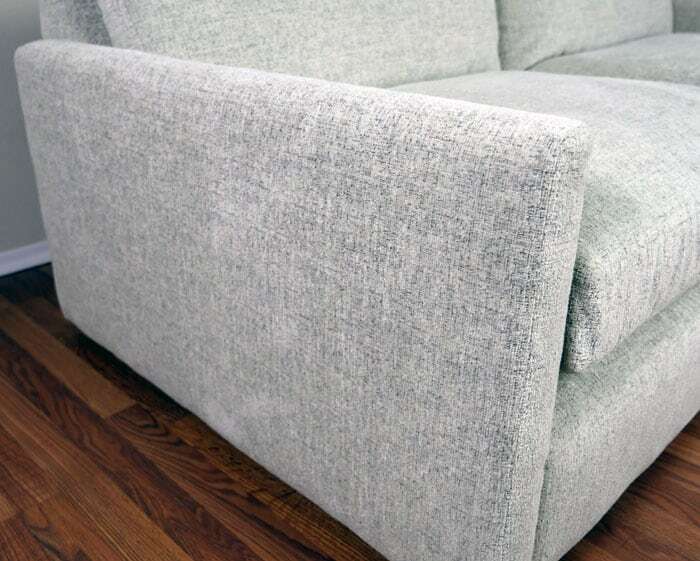 The back cushions of the Kipton sofa are made from an encased poly foam fiber fill, with a removable cover. Remember, this doesn’t necessarily mean that that cover is washable, but being able to remove the cover does make it easier to clean or treat stains. The seat cushions of the Kipton sofa have a bit more give. They are made from a pocketed coil and foam core with a layer of feathers and down surrounding the internal support. This gives the cushion a nice softness when you initially site down without sacrificing the overall support of the cushion, which is provided from the pocketed coil / poly foam core. The care for any of the Arhaus sofa cushions may vary, depending on the fabric you select. 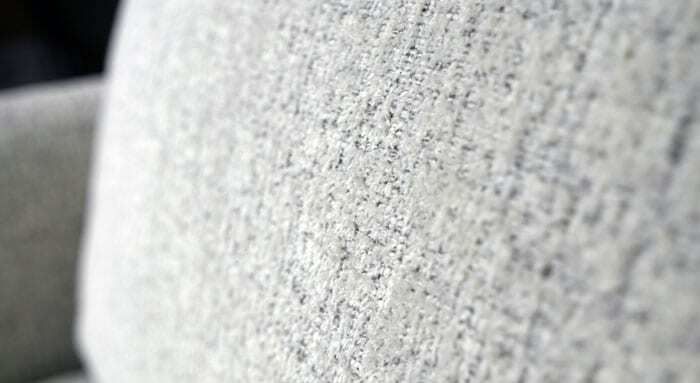 “Plush Linen” upholstery, for example, are intended to be Spot Cleaned using a water-free solvent only. Do not use water or dry clean. On the opposite end of the spectrum, “Easy Care” fabrics are designed with messes in mind. These fabrics are easier to clean and in some cases may be completely machine washable. NOTE: There are currently 24 fabric options in the “Easy Care” lineup that are machine washable. You can order samples of any of the Arhaus fabrics to see and feel them first-hand before specifying them for your new sofa. This list of sofas above certainly isn’t an exhaustive list, by any means, but does highlight some of Arhaus’s most popular models and shows a nice representation of the different sofa leg styles they offer. Similar to the leg style, the style of Arhaus sofa arms can also vary greatly. Here are a few of the most popular styles and some of the sofas that you can find these styles on. For the most modern look, Arhaus offers a simple low arm with a square top. These arms vary in width, but have crisp lines and a simple aesthetic. Should You Buy the Arhaus Sofa? This is a bit of a loaded question because there’s so many options that Arhaus provides, but overall, the brand offer high-quality sofas like what you’d find in a fancy showroom. Lots of style options: Arhaus currently has over 60 different sofa styles available and almost 600 fabrics to choose from. Whether you’re looking for something sleek and modern, transitional and casual, or historic in nature, Arhaus probably has a couch for you. High quality materials: The materials of the Arhaus sofas are very high quality, including the solid hardwood frame, pocketed coil and foam cushions, and hardwood or metal legs. Don’t mind waiting: Receiving an Arhaus sofa after placing an order is not a small feat. Every sofa is offered custom specifications, like length, width, depth, and fabrics. Based on your selections, you could be waiting a while to receive your order. In-stock orders can take up to 3-4 weeks, while custom orders take 8-12 weeks to produce and then an additional 3 weeks for shipment. Want more information on Arhaus sofa reviews? Click here to check out all the choices directly from Arhaus.com. The Arhaus Kipton sofa is a high-end luxury couch. 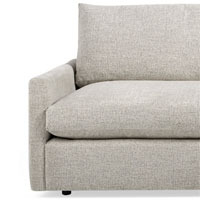 It’s on the soft side with soft seat cushions and medium firm back cushions. It uses a solid wood frame with wooden legs. 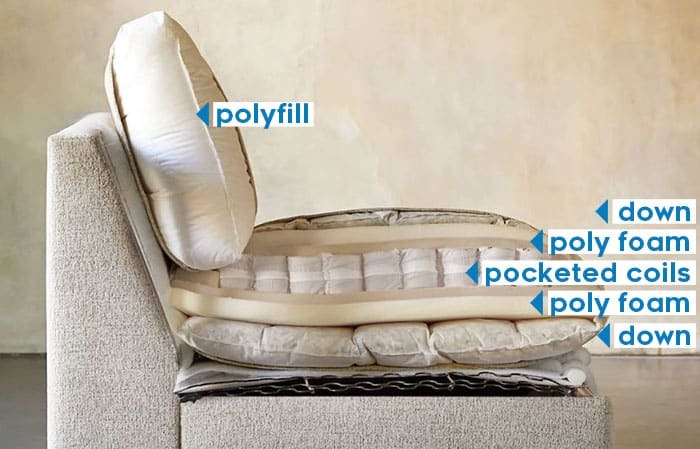 Cushions are stuffed with a combination of down, feathers, poly foam, poly foam, and pocketed coils. It’s not cheap, but not overly expensive, especially considering the build quality and materials included.